The chilly, rainy Tuesday persists as I pull up to the Newport, Kentucky Kroger, a stone’s throw South of the national grocer’s hometown of Cincinnati. Man, there are probably a lot of places I would rather be than here, just another mile—at most—from the smaller Northern Kentucky town where I was raised. But without the means or the time to travel, I find myself here on the hunt for HemisFares, my proverbial ticket to Italy. HemisFares is making it easy to receive applause. It is a brand built on the ‘aha moment.’ The product line is strictly calibrated on a gauge of extensive knowledge and research. HemisFares differentiates itself in the sea of other products by leaning into tried and true greatness, rather than following flavor trends—such as the artist formerly known as the potato chip, which now comes in a daunting array of flavors I never knew existed. 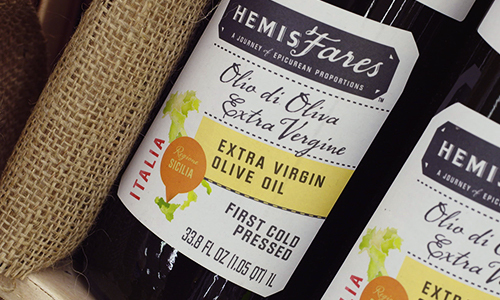 HemisFares might be the new kid on the block, but is in fact really old school. Ponds are hopped, stones are turned, and the lives of master producers are forever changed by the chance to bring the fruits of their ancient crafts to an audience of millions. So, back to Tuesday, back to the aisles I’ve perused and prowled what feels like a million times before, to build my bridge to the Old World with bags of pasta and jars of sauce. What whim takes me to Italy? 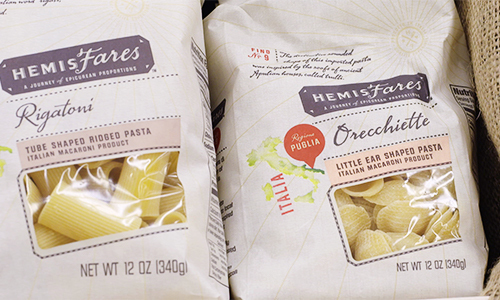 HemisFares debuted with Italian products as Italian is the number one most-consumed ethnic food in the United States. I think it’s fair to say that “Italian food” doesn’t seem so foreign anymore to many of us, but take a look at any one of the HemisFares packages and it’s obvious that we’re not just talkin’ marinara. We’re not even just talkin’ “Italian”: each of the finely crafted packages contain flags on a petite map of Italy marking the precise location of origin… and thus I begin my tour of The Boot. 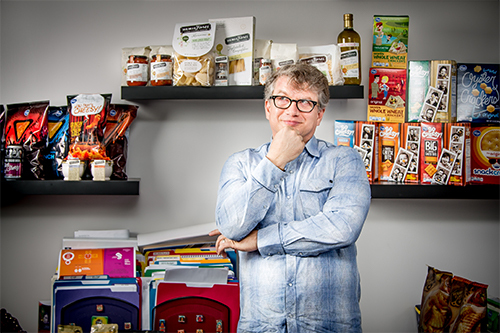 I’m not usually one to gorge on gluten, but oh was it “festa di pasta, here I come”… I got a little over-eager exploring the HemisFares-heavy shelves, and caught a common case of “my eyes are bigger than everyone’s stomachs”. The loot was large and decisions were tough, but what can I say, I wanted to get my fill. The packages are numbered and invoke this “gotta catch em all!” motivation, so I went with it. Rustici ai Porcini, delicate pillows filled with mushrooms and four cheeses, dressed with olive from the Val di Mazara in Sicily and Italian butter (staying really authentic here), and herbs brought the closed-eye moments of culinary bliss Phipps promised. Bites of the spinach and mozzarella ravioli tossed with Sugo alle Caprese, a sauce complete with whole, ready-to-pop-in-your-mouth cherry tomatoes, administered a lot of head nods, and even an “Oh! This is REAL good”… as in, so good I forgot my grammar. The last pasta mash-up of the Italian map was Campania meets Langhe with Anelli Gigante, the round “giant rings” of pasta whose shape I chose to echo the circles of chopped leek in the Sugo delle Langhe con Porri, which is the romantic way to say tomato sauce from Langhe with leek. Nostalgia reckoned this my favorite course. The smell that steams out of freshly boiled pasta glazing over with olive oil speaks to me of my childhood. 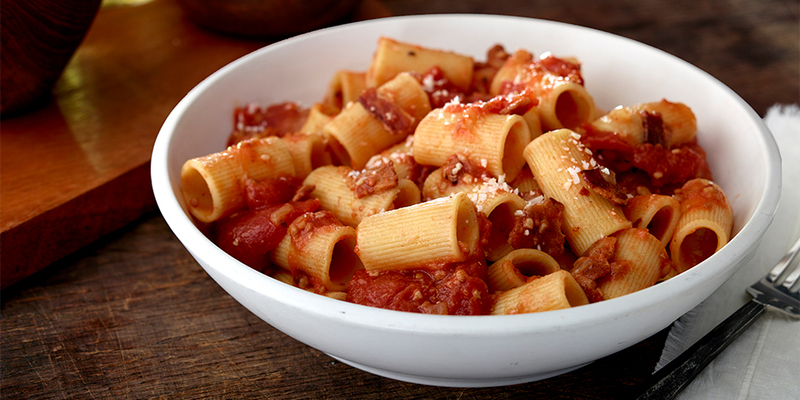 Covered in just the right amount sauce, tacky with just the right amount of parmigiano and black pepper, the pasta lit a smile on my face and a “hey” at my sister of “this tastes like when we were kids”. With little room in our bellies, we nibbled arugula laced with the Sicilian olive oil that proved to be absolutely delicious when tasted in its purity with just a kiss of lemon. Strawberries macerated with Aceto Balsamico di Modena, was a great end to a great night. For me, Kroger has always been about two things: family and nostalgia. I’m glad it has grown with me, matured with me. HemisFares let me host a dinner party on my gray-painted floor, for lack of chairs, for lack of time or means to travel, for lack of time and energy at the end of the day. They’re providing me with an avoidance of sacrifice, with even more to enjoy at a time of day that is very important to me: dinner.